The new Ricoh Aficio MP9002 is our top of the range robust system photocopier for departmental and Schools use. 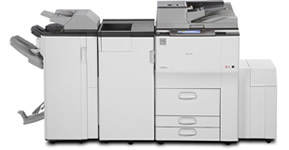 The MP9002 is a fast basic photocopier built with simplicity in mind. It can be configured to suit your print room demands with additonal on line paper supplies with a maximum 8,300 sheets on line. On line finishing devices feature the traditional booklet maker plus hole drill, cover insertion and even a 9 bin mail-box for separation of users output. The Ricoh Aficio MP9002 is a photocopier only but has scan, print and fax options which can be added from new or later if needs change. The Ricoh Aficio MP9002 offers the following features.